Want to venture into the great outdoors with your camera to catch stunning shots of wildlife? Turning your pictures from amateur shots of birds into professional quality images of the animals is tricky. Wildlife photography is one of the hardest to master. Your subject isn’t usually a willing participant and more often than not you’ll find them trying to make a great escape from your camera lens. 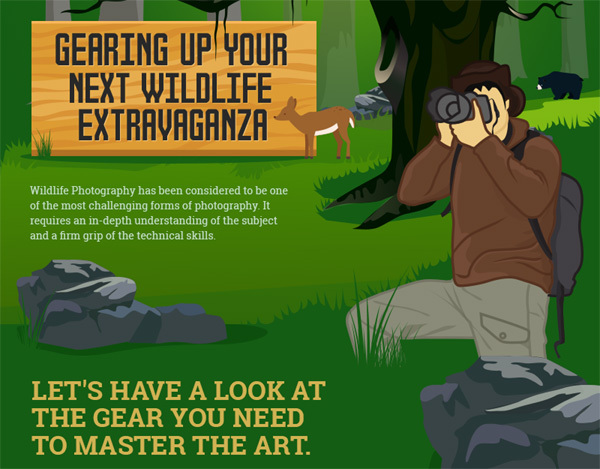 To help, we have put together some tips on getting the right shot and a handy infographic on all the gear you’ll need. The first step in mastering the art of wildlife photography is research. We are sure that you are eager to get out into the wild, but we always recommend preparing. Look in detail at the habits of your subject animal. This will arm you with the best times to head out and capture them feeding, sleeping, breeding, or any other scenario you might want to capture. Not knowing or not having an understanding of your subject’s behavior will make getting a great shot difficult. If you want to get the best shots you can bet the one trait you are going to have to work on is patience. It could take you twenty minutes to catch a glimpse of that rare animal you are looking to photograph. It could take you 20 days. Wild animals bend their knee to no man, so do not expect that rare bird to come out and pose for your photos. Wait patiently and you will be rewarded. Getting close to your subject is not easy. If the subject animal is particularly skittish it can ruin your chances of a good shot. But zooming in on subjects can ruin the image quality if your camera isn’t up to par. If you are finding it particularly difficult to get close to the animal for a good shot, consider investing in a quality, powerful zoom lens or prime. This will allow you to get high quality shots from a distance. Lighting can make or break an image – get it wrong and that moment you have been waiting so patiently for is ruined. Get it right and your image will look magical. Understanding how you can use it to your advantage is important if you want to create professional looking images. A general rule is to try and avoid shooting around midday. This is when the sun is at its highest causing dark shadows and bright spots. Backlighting is popular in wildlife photography. Capturing your subject between yourself and the source of light can have a stunning effect, often creating a silhouette. Wildlife photography is unpredictable and we are not just talking about your subject. The weather can make or break a shoot as well. Check the weather before heading out and take the appropriate kit for the weather you are going to face. If rain is predicted, make sure you have a waterproof cover for your camera and an umbrella at the ready! Do you have any exciting experiences photographing wildlife? Adam Chapman works on behalf of Tusk Photo. They are South Africa’s leading provider of wildlife photography tours and safaris to clients from around the world. Their first class service transports you to the wild world, helping you capture every moment on film.